This coffee filter angel craft is very easy to make, yet it looks very impressive. 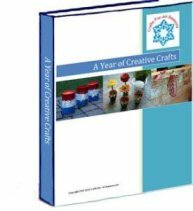 This craft is easy enough for most children to make, all by themselves. She will look very elegant hanging as an ornament on your Christmas tree. These are hot sellers at craft fairs, and they are inexpensive to make. The Styrofoam cones and balls, and the gold rings, are usually sold in multi-packs. This makes it cheaper to make several angels than just one, perfect for Sunday school projects. This angel would make a wonderful gift! If you would like to see another craft project using coffee filters, be sure to check out the coffee filter butterfly! 1. 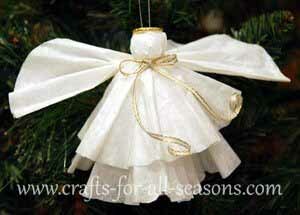 Begin your coffee filter angel craft by placing a coffee filter over the Styrofoam cone. Then, place a toothpick through the top of the coffee filter, pushing it at least half way into the cone to hold it in place. 2. Next, pierce the Styrofoam ball through the toothpick to hold it in place. 3. Place another coffee filter over the ball. Cut a strip of gold ribbon and tie it tightly around the bottom of the ball, to define the head of the angel. Tie the gold ribbon in a nice bow (thin wire-edge ribbon is great for this). 4. To make the wings, take the third coffee filter and fold it in half lengthwise. Next, gather and pleat the coffee filter in the middle, as shown. Then tie the middle area together with a small piece of white thread. Then, hot glue the middle of the wings to the back of the angel, right below her head (adults should do the gluing). Or, the wings could also be pinned using a straight pin, piercing the wings into the Styrofoam cone. 5. Glue the gold ring on top of the angel’s head. The angel can just stand alone or a ribbon or thread could be added to her back for hanging on the Christmas tree. .